Competitive pricing in Tacoma has inspired both urbanites and families to flock to the City of Destiny. Downtown boasts an enviable waterfront and a unique blend of modern construction with vintage staples. Its residents are known to be engaged in civic and cultural communities and organizations. Writers, entrepreneurs, musicians and more join together to support the city they call home. There are many charming residential neighborhoods to lay down roots with good schools and big city amenities. It is the perfect place to start a family and grow an urban farm with up to 6 chickens! With tons of parks and festivals, there is always something fun to do for all ages. 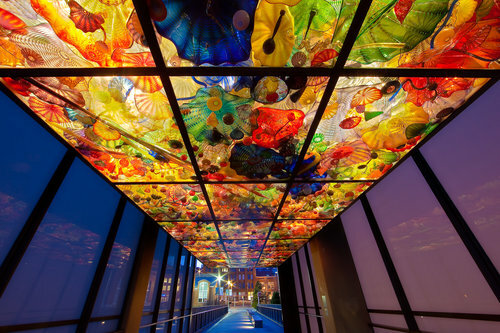 Museum (Did you know that world-famous glass artist, Dale Chihuly is from Tacoma!) and America’s Car Museum. Tacoma also has Point Defiance Park, which is the largest urban park in Pierce County complete with a beach, seemingly endless hiking trails and the local zoo and aquarium! The city is home to a number of great universities. Students attending University of Washington’s Tacoma campus, University of Puget Sound, Evergreen State College’s Tacoma campus fill the area with a youthful energy. There are many hikers, runners and cyclists at all times of day on their way to work, taking a break or simply taking advantage of all that the Tacoma area has to offer. Commuting in Tacoma is no problem, whether you are driving or walking. The city has a light rail connecting many neighborhoods and is in the process of expanding. There are also long-term plans connecting the Tacoma light rail to the rest of the region. If an out-of-state trip is made for business or pleasure, the Sea-Tac Airport is under a thirty-minute drive away. One perk of living in Tacoma is that Tacoma Public Utilities covers power, water, sewer, garbage and storm drain. Rather than coordinating with many different service providers, your needs are taken care of in one stop! Tacoma’s bustling and vibrant culture is growing every day, bringing in new and exciting opportunities while maintaining its charm and character. The Kari Haas Real Estate Team is ready to help you find your home in one of its best residential neighborhoods or urban areas. You tell us what you are looking for and we will find it.